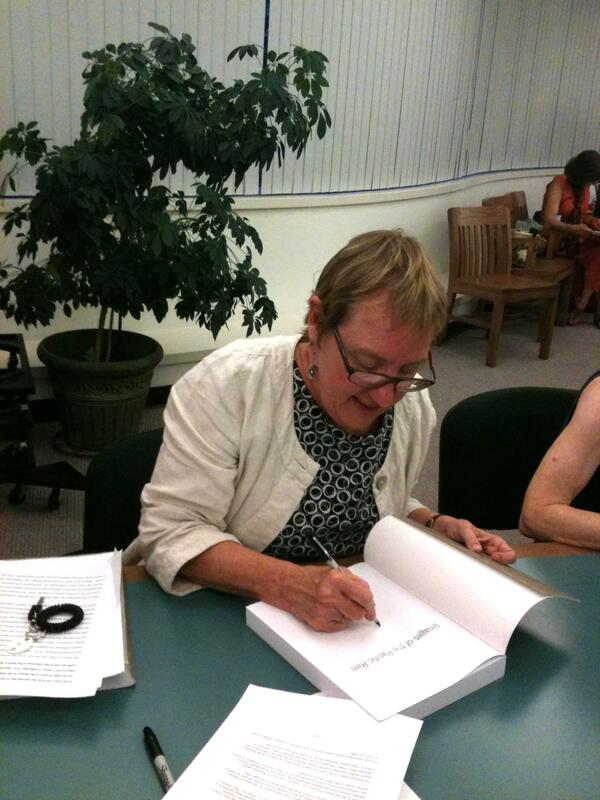 The photo above is me signing books at one of my lectures, I think at the California State Library. It was one of the only photos I could find of me in action as an academic! When I was in high school in suburban California so many years ago, the public educational system in the state was still one of the best in the country. Instructional emphasis was on learning to think, to read critically and, most importantly, to write clearly and coherently. My 11th-grade English teacher had us write an essay every week; he marked up every one, pointing out grammatical errors and compositional problems (he once wrote “TRITE!” across my entire paper), but he also praised our ideas when they were well articulated. He even read the best ones on a local radio program, and explained why they were well-written essays. This early training in how to express ideas in clear sentences and with fluid transitions has served me better than anything else I have learned in all the succeeding years of college and post-graduate experience. In my many years of teaching–on whatever subject, at whatever level, and in whatever country–I adhered to the principle that my job as the instructor was to help students learn to write well. I took this task very seriously. Many students were impatient about all those red marks on their papers–“This is a class in art history, why do I need to worry about commas and declarative sentences?” they would say–but I hope that some of them took these comments and this guidance to heart and applied it to all their subsequent efforts to write. These methods are appropriate to ALL writing, not just topics in the humanities: I have helped scientists write their papers, applying these principles to topics about which I understood not a word. So I present here some simple steps that, if followed, will lead to clear, concise writing. Some would consider this guidance as old-fashioned, but these suggestions will not fail in producing better prose. Whenever possible, write simple, declarative sentences. More complicated sentence structure can intermingle nicely with these short ones. Avoid the passive voice. ‘There are’ and ‘it is’ are not strong ways to start sentences. Avoid contractions, e.g., ‘isn’t,’ ‘can’t’, in formal essays. Contractions can work well in journalistic or personal writing, but not in academic papers. Tell me what you’re going to tell me, tell me, then tell me what you told me. The grand man of my graduate department, a famous British scholar, used this very phrase to explain how one organizes ideas in a paper: have an introduction, main body of the text, and a conclusion.. This advice is as applicable to a short essay as it is to a thesis. Avoid using ‘it seems’, ‘perhaps’, and especially ‘I think.’ Just state the argument! This is your writing and the reader knows what you are writing is what you think. State your arguments as confidently as possible. ‘It seems’ , etc., is just a waste of words. Simple, no? It sometimes takes years to perfect the application of these “rules”, but the results are worth it, to you and to the reader of your work. G. & E., an anniversary. Last year was our fortieth anniversary, but we were in New York then, so I didn’t get to write about “our day” in that milestone year, but I’ll give it a go to mark our 41st year of being an official couple. 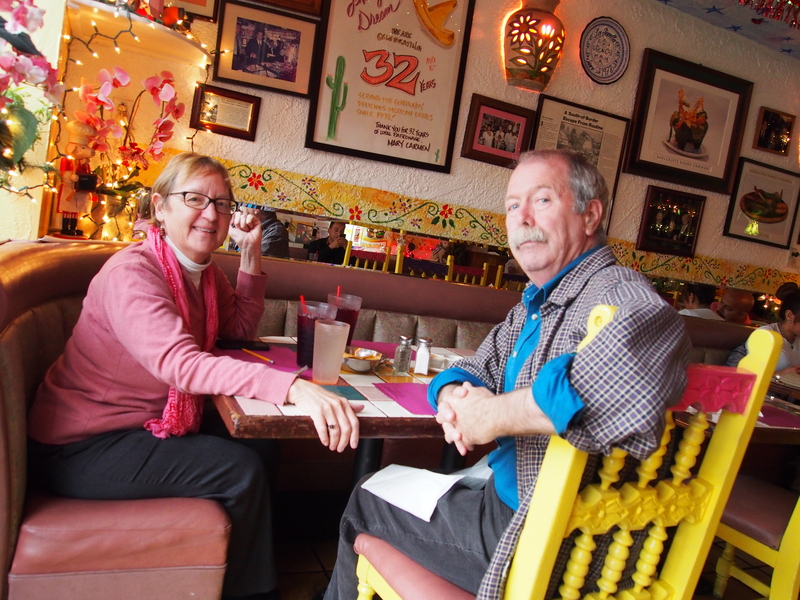 The above photo was taken on March 16, 1974, in Logan, Utah, right after we had exchanged “engagement jewelry”–Navaho turquoise George bought from old rodeo riders– and decided that we would make it official on March 17, St. Patrick’s Day. We were happy that the day marked another occasion so that we wouldn’t forget what day our anniversary was. This photo is as close as we have to a wedding photo, because we didn’t really have a wedding at all. Here’s a bit of our story, to explain why. 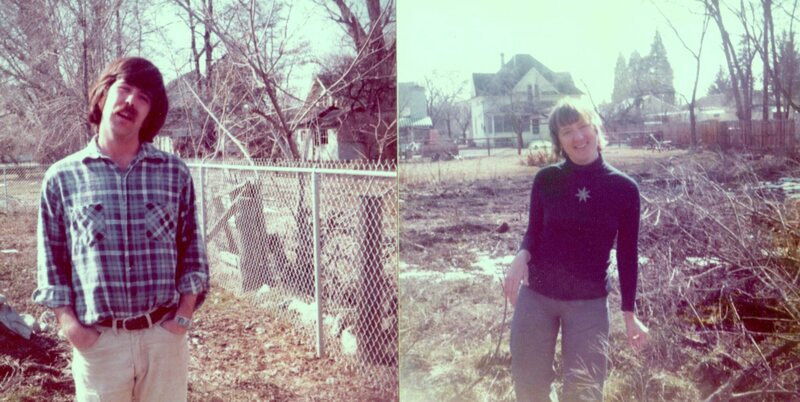 George & I met at the University of Denver’s Library School in the autumn of 1971. Although we had classes together that quarter, we really only noticed each other when a group of us met for coffee each morning at 7 a.m. before our 8 a.m. cataloging class in the winter quarter, which we all dreaded. It was an especially cold winter, so we all had to drag ourselves to the cafe to be fortified with caffeine if we were to have any semblance of awakeness in a class as tedious as AACRII cataloging rules. At the time, I was living with Nick, the boyfriend I have written about before on this blog. And George was married! (Silly boy, he got married when he was 19, for reasons that neither of us can now understand). It was a nice mixed group that met for coffee, from would-be priests to old radicals and disgruntled Army vets, and we would have some great, if sleepy, conversations. At some point during that quarter–toward the end, I think–I had a realization that I had to get out of the relationship I was in, even though I was totally financially dependent on him. One evening, feeling completely desperate about my situation, I decided to go over to the campus library–something I had never done before after dinner. And who should be there but George, who also never appeared there after classes. When I asked him what he was doing there, he held up his hand to show me that he was no longer wearing his wedding ring. His wife had apparently run off for a weekend with a computer programmer from Boston; when she returned, he left her, in their apartment with all of his things, and was sleeping in his brother’s van (in a Denver winter!). My, my: kismet! So we went to coffee, and talked it all over. That was the beginning of the end of our old relationships, and, while it took three years and a LOT of water under the bridge–George moved to Golden, Colorado, I lived with a family near campus and took care of their kids, then George got cold feet about us, he worked in a home for mentally challenged adults in Boulder, I got a job at an architectural firm in Denver, then a real library job in Portland, Oregon, and thought sadly that we would just be good friends–we finally realized we loved each other and wanted to be together, just as I got a Fulbright to go to Germany! 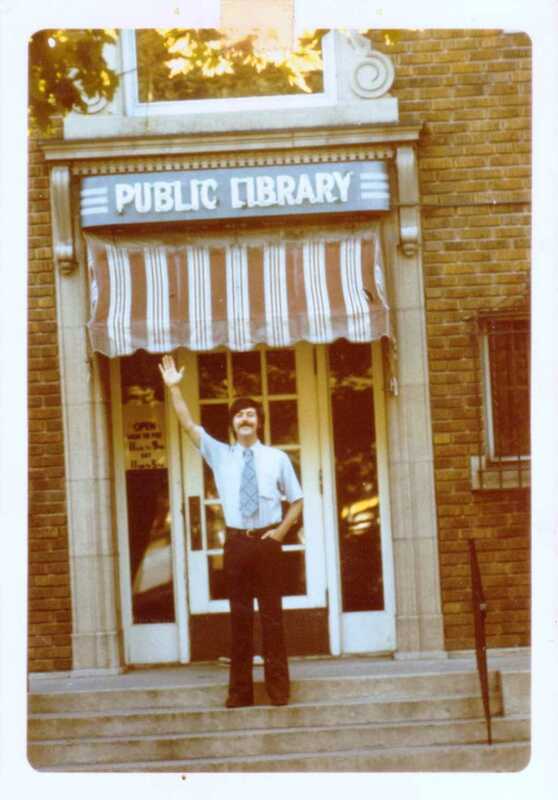 At the same time, George was appointed librarian for the public library in Logan, Utah! Hmmm, what to do? We had one tumultuous meeting in Santa Barbara before I left for Germany and he took off for Logan. It was then that we “plead our troth” or whatever that phrase is. 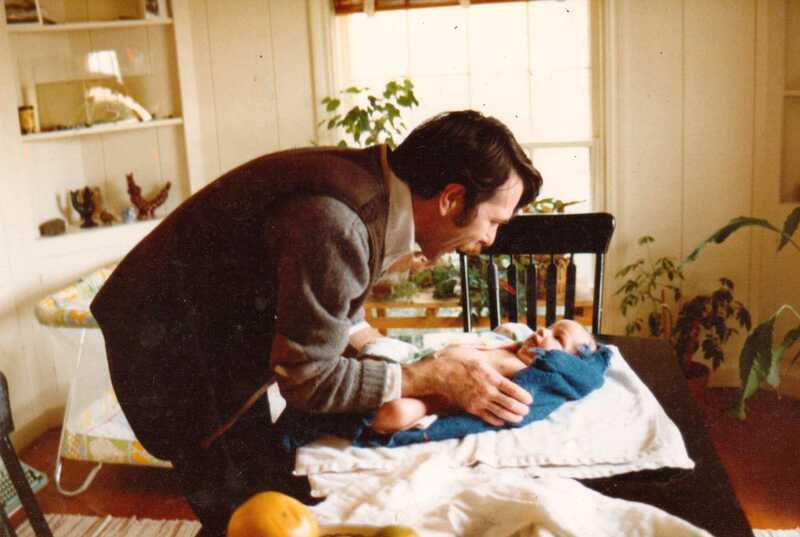 But my mother was horrid to him–kicked him out of the house while he was waiting for me to come down from Portland, and did everything she could to keep us apart during that visit. That’s one of the reasons we had no wedding when we finally got around to being an official couple–my family and I were then not on the best of terms. So I went off on my Fulbright year, thoroughly angry that I was missing someone horribly. Here was my great adventure, a watershed year intellectually and culturally, and I was lovesick! I had a wonderful time, even had a professor boyfriend (hey, we weren’t married yet, were we? And a year is a long, long time when you’re 24!). But by February I was really, really pining. My wonderful professor friend, who had not a bone of jealousy in him, actually gave me the money to return to see George. So on my spring break from the Technische Hochschule in Darmstadt, I flew to Logan, Utah. A return to the States during the Fulbright year was a real no-no–streng verboten–so all my colleagues in Germany had to lie for me. I didn’t even tell my family I was back in the States, for fear there would be repercussions from the Fulbright Commission. George meanwhile was establishing himself as the director of the library in Logan. Logan is in a beautiful location in the Cache Valley, surrounded by imposing mountains and sweeping vistas. But the town was entirely Mormon, except for one Presbyterian minister and his congregation, and some of the students and faculty at Utah State University in town. George said as soon as he got to town, everyone started introducing him to their marriageable daughters–but first they tried to convert him to Mormonism. He was the highest-ranking non-Mormon in the county. It was really an odd experience to sit on our porch on a Sunday morning, and watch EVERYONE in the neighborhood going down the street to Temple, coming back home for lunch, then going back down the street back to Temple again. No one ever acknowledged the heathens on the porch. It was as if we were invisible, or in some alternate universe. But the non-Mormons in town were not much better, spending all their time complaining about the Mormons, and the fact that you couldn’t get a cup of coffee in town anywhere (but the cafes made unbelievable buckwheat pancakes!). It was clear to us that neither of us would be happy staying there for the rest of our lives. When my two-week break was about to end, we decided that before I returned to Germany,we’d get hitched. The Presbyterian minister was peripherally involved (his name was Miner Bruner, I’ll never forget that), but that’s about the only person in Logan I remember. We celebrated with corned beef and cabbage–it was St. Patrick’s Day, after all!–and the next day I flew back to Germany. In July, George’s contract was up and he gave his resignation, and joined me in Europe for our “honeymoon.” For many years, my mother thought we got married in July. I think we finally told her the truth after Max was born. So that’s our story, way back in those hippie days of the early 70s! We have since lived in Denver; San Antonio; Philadelphia; Vienna, Austria; Fort Worth; New Orleans; Appleton, Wisconsin; Canberra, Australia; and now Pasadena, California. We called ourselves gypsy scholars, although things slowed down a bit after Max came along. We have always done everything together, because we are each other’s best friends, and share so many interests. We don’t like to be apart for long, but we’ll do it if we have to (some people describe this as co-dependent, but I have always thought it was just a good marriage!). Now we’re about to make another big change, which is only limited at this point by our creaking bodies. But we still love each other, and, most importantly, LIKE each other! I don’t know what I’d do without George’s conversations. So tomorrow we’re going out to lunch to celebrate, and then over to the Getty to see the Turner show. Here’s what we look like today. Not too bad for senior citizens, eh? And so we continue our marvelous adventurous journey together! My friend Meher, who has been dutifully writing in her pretty blog EVERY DAY as she gives away something EVERY DAY (https://mehermc.wordpress.com/), has inspired me to get a little bit better about this blog business. I realized that, instead of short little notices on Facebook about my anxieties and the many changes that we are about to face in our lives, I should be venting and expressing my feelings here, in this online diary. Changes: I used to find them adventurous and exciting. But now as we both face retirement and the end of our working lives, the necessity for life changes seems more daunting, and downright frightening. Who would have thought that we of the boomer generation–who felt that the world was our oyster, and never really planned that much for the future–would find ourselves, at 65, completely terrified about the next phase? In our case, it all boils down to money, or lack of it–I’m sure we’re not alone. AS George was incapacitated after his accident–hit by a car on his bike!–we sat down and finally looked brutally at our financial resources once we retire. It was as I expected: not nearly enough to do the things we want to do, and BARELY enough to scrape by in our Pasadena house. So we are now having to decide which path we should take, and how to take it. We’ve “postponed” our planned trip to Vienna, we’ve had a realtor come and evaluate our house for sale, and we’ve started looking to find a place that we would find suitable to live that we might be able to afford. Thrown into the mix are considerations of chucking it all and taking off for a year around the world, stopping in several places where friends have offered us accommodation or at least some friendly guided tours; or renting out the house while we make smaller trips; or moving back to Australia. Also to consider: 1) where are Max & Dottie going to be, and can we be close to them? ; and 2) what do we do with the cats?